Thanks guys! I had loaded up the rem 240gr Semi Jacketed Soft Points with a healthy dose of H110. That bullet should have been moving at about 1400fps. I was shooting at a downward angle. Bullet entered 3 inches below the spine on the left side and exited just behind the right shoulder. Clean pass through the boiler maker. DUG was using a PMC Semi Jacketed Truncated Cone 185gr that was probably clipping along at 1500-1600fps. It was such a rush sneaking in on the pigs. Everytime i crept forward thinking they would bust at any moment. Dug shot his and i had one less than 50yds away but on the same side of the hill. It was so thick I couldn't see it. So we were shoutin to each other when another pig busts out and thats the one i smoked. I need to start wearing a go pro. It was a shot of a lifetime for sure. If only i didn't have a 31.5" draw length. I would jump on it. I shouldn't have sold my last hoyt. Thanks everybody! The real star of the hunt was DUG. Aftter the miserable conditions the first few days he agreed to go back with me. Thursday he was on his game. He had it all figured out, he called their every move. He picked out the bull bedded behind a small dead fall through a juniper that was the last thing between us and him. Thanks Dad for an awesome hunt! I will check around see what I have and see what we have at work. luke duke posted a topic in Birthday Wishes! 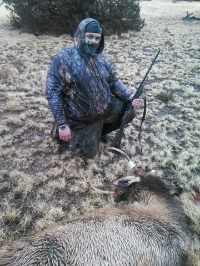 Its a day late but we were chaising elk yesterday. Glad to spend your bday with you out hunting! My mom bagged a nice little buck! DUG will be along to relate the whole story. luke duke replied to naturegirl's topic in Sticker Sightings! That was me. Yes i work there. Yes that scope has a 30mm tube for better light transmission and clearer picture at longer ranges. Great price. Bump for a great gun. Go to the Zeiss website. It explains everything there. My Dad looked at getting a Zeiss, but it was hard to read the lines. Most scopes like this you zero at 200. We met a guy on my dad's cow hunt in 7W last Dec. and he told us about this place. Glad to hear it's finally opened. Not too far from our house.